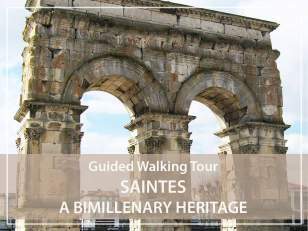 Don't miss the monumental jewels in Saintes: from the Gallo-Roman remains of the first capital of Aquitaine to the pearls of Romanesque Saintongeais art, choose the guided tour of Saintes! Founded in the 1st century, Saintes is today labelled "City of Art and History". On the banks of the Charente river, Saintes offers an exceptional architectural and religious heritage. The vestiges of the Gallo-Roman amphitheatre, now known as the"Saintes Arena", is the most important vestige of the ancient capital of the Roman province of Aquitaine. Germanicus Roman arch, once erected at the entrance of a Roman bridge, now disappeared and saved thanks to Prosper Mérimée. The Abbaye-aux-Dames, founded in 1047 and its abbey church, in particular its exceptional Romanesque sculpted gate. Given its beautifully restored appearance, it is difficult to imagine its decline during the Revolution and its transformation into a barracks until the 1920's. St. Eutropius Basilica built from 1081 by the monks of Cluny around the St. Eutropius tomb; he was the first bishop of Saintes. It is certainly one of the most interesting religious buildings of the Saintonge, both for its layout, its antiquity and the exceptional Romanesque ornamentation of the columns heads.